B Moreno López (2018): “The use of pseudoscience and experimentation as a persuasive resource in new advertising communication trends”. Revista Latina de Comunicación Social, 73, pp. 1428 to 1443. Over the years, advertising communication has sought to use creativity to differentiate products and brands; using all possible resources available and with no hesitation in absorbing techniques and methods from different disciplines for the symbolic creation of values and perceptions. With the technological changes and developments in the last 15 years, advertising communication has evolved substantially to adapt to the new media arising in the digital environment. Thus not only the media have transformed but, consubstantially, the means of communicating, objectives and ways have evolved. This scenario has led to the emergence of various, apparently antagonistic, advertising trends. We can see the rise in new vintage trends that recover what is artisan and handmade, while campaigns are developed with increasingly technological applications (bots and new artificial intelligence, for example). These include a great tendency towards scientific and pseudoscientific justification. This not only involves applying neuromarketing to sales environments, but rather recovering old product demonstrations with brand values or understanding the insights applied to a creative concept. Advertising creativity recovered old psychological experiments used in the ‘60s and ‘70s, such as the marshmallow experiment, applying them to new creative proposals in special actions. In this way, psychological and sociological advertising experiments find a new way of using the product “demonstration”, or a “scientific” argument for the purchase, creating a brand image or promoting a change in attitude. This text analyses the most representative examples of this recently extended practice in order to analyze their characteristics, conceptualization and audiovisual production, so as to better understand the mechanisms used by the advertising sector to persuade and convince about certain changes in attitude. Creativity; advertising, pseudoscience; sociological experiment; viral advertising; experiential advertising. 1. Introduction. 2. The new profile of the scientific community. 3. Changes in publishing practices. 4. The consolidation of collaborative research. 5. Objetives and method. 5.1. Objectives. 5.2. Sample and unit of analysis. 5.3. Coding and reliability. 6. Results. 6.1. Gender distribution of authors. 6.2. The contribution of public and private universities. 6.3. Evolution of authorship. 6.4. Forms of collaboration between Spanish researchers and funded research. 7. Discussion and conclusions. 8. References. Our world is changing greatly each day. This is even more evident when we analyze in depth the evolution of products and brands towards the era that French sociologist Gilles Lipovetsky called hyperconsumerism (Lipovetsky, 2010). Major companies have gone from being manufacturers to also being creators of stereotypes, appropriators of symbolic values they reconvert, and content generators. In the ‘90s, under the pressure of the globalization process that criticized the capitalist system and sought to eliminate product differentiation by creating empty values and attributes, brands reinvented themselves and became much stronger. This occurred thanks to what Kevin Roberts, CEO at Saatchi & Saatchi, called the age of attention (Roberts, 2005). Brands held all the attention of consumers and with it had access to almost all communication channels in a more or less simple way. These were complicated years for brands because criticism was stimulated by the social and economic consequences their evolution had on the economic and social environment of the time. Of all the criticism produced during the Year of Exploitation  the need arose for much more transparent communication, particularly regarding product manufacturing processes. Because consumers became much more aware and apparently more responsible in their consumption. At the same time, selling values and customer loyalty required greater efforts as consumers no longer accepted selling empty, frivolous values, requiring values based on the product and by what has recently been called “content marketing”. Offering consumers much more: entertainment, information, contributing to sustainability, ecology and the common good. Thus, the concept of advertising communication also changed substantially as of the late ‘90s. The companies that overcame the crisis were those that based their communication on value marketing, on the fact that products could offer consumers something much more intense and deep than a mere lifestyle based on frivolity and nonsense. Naomi Klein mentions, among others, The Body Shop, Starbucks or Steve Jobs’ Apple (Klein, 2005). Companies that could not maintain this value marketing have gradually revised their advertising method to make the content more responsible, transparent and less fatuous. They have worked on a communication that focuses less on selling empty values and more on real action, experiences or comparable facts. Or at least that was their intention. “We live in times of change, of transit, of coexistence between different cultures. Hybrid times in which disciplines intermingle and barriers are blurred. Strange times in which new ways of communicating arise, so different to what we have known until now that we do not even think they have anything to do with what we understand as advertising. These are times of post-advertising”(Solana, 2010: 19). While society itself is changing, changes in technologies and, therefore, the media also become more evident. Changes that affect possibilities for advertising, when it comes to devising new ideas and developing more surprising and novel projects. Changes that have been surprising and stunning us since the late nineties and early two thousand, and which are still a constant source of continuous and reviewed analysis. Consequently, it is obvious we should obtain new advertising strategies that change frequently and, according to Gary Ruskin, Executive Director of Commercial Alert, that the industry generates new communication mechanisms in a desperate attempt to attract the attention of current and potential consumers (Lenderman & Sánchez, 2008: 48). “In the world of marketing not only have transmission channels and formats changed, but the receiver-consumer is capable of distinguishing, of discriminating between the many messages they continuously receive, ‘unmasking’ mere advertising claims and ‘sponsoring’ those products that really meet their expectations as a consumer”(Olmedilla, 2011). We have therefore found that, with the arrival of the Internet, brands disseminate information in a three-fold manner: from the brand to the consumer, from the consumer to the brand, and from the consumer to other consumers, including their personal judgments on product or brand information. Thus, concepts such as viral advertising or social network advertising are starting to appear in all advertising briefings. Furthermore, the goals of advertisers include that advertising should not only be consumed, but also shared and commented by consumers, thus contributing to a greater number of advertising impacts without increasing the economic cost of media placements. Therefore, and so as to make the consumer part of the process and contribute with their comments to extending the brand network, the only way to achieve this is to give the consumer content they consider relevant in some way. Finding something that meets their expectations from a communication perspective: leisure, fun, experiences or relevant for reflecting. In addition, taking into account that consumers seek certainty and comparable data, it seems normal that advertising should seek to endorse its communication with science or a scientific appearance. This is the reason that so-called “sociological experiments” are more commonly used in advertising communication and have become a “trend” for a time. Sociological experiments in advertising are commercials created following the structures of the psychological experiments that had their heyday in the ‘60-’70s, such as the famous “Marshmallow experiment” on controlling impulses conducted at Stanford University in the 1960s by psychology researcher Walter Mischel. See (Mischel, Shoda, & Ozlem, 2008). But, in these cases, they are adapted to suit the communication of a brand, product or service. In the last six years especially, the use of social experiments in advertising has skyrocketed, creating a communication rend as, if they are conducted properly, the experiments work at a persuasive level. Above all, brands demand differentiation from their competitors. This requires a detailed study and analysis for various reasons. Firstly, because sector professionals need to understand the creative resources available to them, as well as the social consequences. And secondly, because it allows consumers to better understand the persuasive mechanisms used by brands. Back in 1992, while Lluis Bassat was using the inauguration of the Olympic Games in Barcelona as the best advertising campaign for tourism in the city, José Luis León, a specialist in creative advertising and persuasion, said that, “in advertising and propaganda you do not tell the whole truth in the messages because there might not be sufficient space for it, but also because certain keys to persuasion forbid it” (León, 1992). The sociological experiments studied here use this scientific appearance as a method of persuasion and may lead to error. Here we have considered them to be pseudoscientific according to Armentia’s proposals regarding the etymological definition of the word pseudoscientific, which leads us to see it as false science (Armentia, J., 2002), precisely because there is always a persuasive goal behind advertising communication and that persuasion, as we have seen, can lead to misinterpretations or false beliefs if the consumer does not have a grasp of the language used by the source. We can consider them to be pseudoscience, to a certain extent, if we heed the proposals of US philosopher Paul Kurtz, as they do not use rigorous experimental methods, they lack a testable structure and, although the results are positive, they have not been directed by rigorous, impartial researchers (Kurtz, 1981). The truth is that, while they are far from pseudoscientific disciplines such as astrology or homeopathy, these sociological experiments take on a scientific appearance, showing cases with real reactions that seem to respond to the advertiser’s needs. This is merely appearance and not reality as the sample selection methods are questionable; they do not indicate the subjects studied and rejected; they do not work with a broad sample base and, additionally, in some cases we can find evidence of bias or direction and intentionality in the selection of shots. Mario Bunge, a philosopher from Argentina, considers man to be the supreme forger in all fields, and advertising could be no less. And in this forging of science, the worst way for him “[...] is to present non-scientific, or non-technological, items as truly scientific or technological respectively” (Bunge, 1985). If we do not know the methods of persuasion of advertising and the resources used to achieve its goals, these sociological experiments could seem truly scientific. Advertising, according to Gay, “due to its nature is concerned with conduct, with ethos, and is therefore subject to ethical consideration” (Gay, 1998). Its construction can be assessed and highly criticized from an ethical perspective, and must be considered especially from a social perspective. Nevertheless, although this paper does not further explore the obvious ethical-political consequences of this type of advertising communication as this deserves a separate study, we must take into account that they do occur and influence our perception. Thus, we will merely present an approach from the perspective of creative advertising and how agencies and advertisers use this pseudoscientific resource to obtain greater advertising impact. And always taking into account that, although the examples presented appear to be scientific, one of the main characteristics of scientific method comes from Hume’s core idea: “the burden of proof lies with who makes the affirmation” (Armentia, 2002). This leads us to understand that, as the source is a brand with clear persuasive intentions, its affirmations (whether scientific proof or not) must always be considered from a perspective other than informative. In the case in hand, according to the words of US publicist Edward Bernays, father of modern propaganda: “[...] whether propaganda is good or bad will depend on the merit of the cause urged, and the correctness of the information published” (Bernays, 2010). Therefore, we will see that this type of mechanism is better accepted in the understanding of the consumer when enunciated by a non-profit organization or foundation than when it comes from a commercial brand or multinational. This is a qualitative research study, in development at the time of research, which entails greater complexity precisely due to the flexibility of the object of study. For this purpose we combined observing the advertising environment, studying specific cases—which represent the bulk of the research—and analyzing the content of each case. Eleven commercials with the structure or appearance of a psychological experiment were taken as a sample to be analyzed. Three of these are international, to allow for a less local perspective. All were selected according to two criteria: awards received at advertising festivals and/or the number of views on Youtube and appearances in the media. This research was conducted based on the hypothesis that there is an advertising trend based on communicating the results obtained in social experiments designed by a brand. 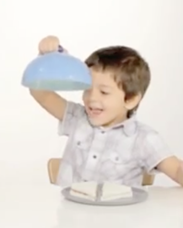 And that these experiments include common features and points that can be reproduced in future commercials. The essential premise of these pieces was the concept of truth and refuted facts. The objectives set were to establish these points in common and generate an overall theoretical framework for this type of advertising in order to look at the issue in more depth in the future. Faced with fragmented audiences and multiple communication channels, any communication designed as content of interest for the consumer will have a viral element, contributing to increasing the number of impacts and not just quality. That is why “sociological experiments” have increased greatly. They combine various essential points for brands: they offer participants a unique experience, resulting in the quality of impact; they show real, unmanipulated reactions, contributing to their credibility; they follow a seemingly scientific structure, which also contributes to the credibility of the message; and finally, they make the viewer-consumer think or smile, boosting their viral nature and leading to them being shared on social networks. In 2011, advertising agency Shackleton, whose creative director is Juan Nonzioli, proposed a creative solution for Action Against Hunger which sky-rocketed the spot’s likes, retweets and number of views on the Youtube channel. According to staff at the agency, “the idea consisted in creating a visual metaphor on how the world works” (Shackleton, 2011) and to do this, they brought together several children aged between 4 and 6 to an empty space at snack time. One had a sandwich on their plate, the other didn’t. The children’s reactions were filmed and enabled the agency to conclude that we should learn from them and their ability to share. 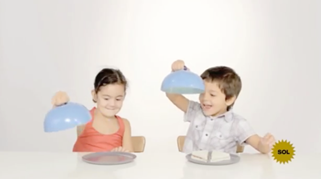 The video won many awards at the main Spanish advertising festivals. From then many brands, organizations and agencies jumped on the bandwagon of experiments for their communication. 1. It appeared to be scientific with empirical results, resulting in an even more authentic appearance. 2. It was based on the hypothesis that the children would share, which is a risk in advertising; the risk that this hypothesis was not confirmed and the shoot had been done for nothing. 3. The hypothesis was the result of the insight work, something much more intimate and deep. This is because this insight connects with the consumer in a closer, more personal way, making them feel that they are not alone, they are not the only one, and that there is a feeling of communion between the brand, him and many other consumers and users. And this is undoubtedly what leads to sharing the others' experience on social networks. 4. The children’s reactions are real and spontaneous. They have not been manipulated. However, some shots, such as the case of the two children who find a sandwich split in half, could lead us to think that the responses may have been slightly directed. Fig. 2: Experimento Comparte by Shackleton, for Action Against Hunger. 5. The setting is neutral and the communication goal remains to evoke the reproduction of psychological experiments. 6. From an advertising perspective, production is highly inexpensive. It involves very few participants, one single, indoor location and few props. Similarly, post-production is simple. Close-ups and no special effects. These fundamental issues are the basis and starting point for creating the remaining pieces that followed, especially in Spain, with the same creative approach or similar. Thus, based on this first analysis which gave way to the initial theoretical framework, these points were used to analyze the remaining advertising pieces. The structure of these advertising experiments originally comes from psychological and sociological experiments. They have the appearance of a quasi-experiment and allow to observe the behavior of the subjects who could not be observed in another way, while also allowing this without affecting the subjects. In scientific research this type of experiment generates debate as they are not quantifiable and often cannot refute a hypothesis. However, in the case of social research, the fact that the methodology has certain weaknesses does not invalidate the research provided that they are taken into account throughout the process. Furthermore, regardless of their varied designs, these quasi-experiments can collate exact information that can be extrapolated which, according to Judd and Kenny (1981), make them perfectly valid. As in the advertising pieces we are referring to, according to Roser Bono Cabré, one of the main characteristics of these quasi-experiments is the selection of participants. In both cases the subjects are volunteers or preselected (Bono Cabré, 2012). In the case of advertising, 54.54% of the pieces analyzed previously selected the subjects or actors involved in the advertising experiment. But just 36.37% knew that a brand or organization was behind the action, which in some way would then affect the end results. Although all the pieces selected offer findings based on facts that are apparently proven according to the sociological experiment conducted, 45.45% of the pieces do not have this scientific appearance but favor a commercial appearance. 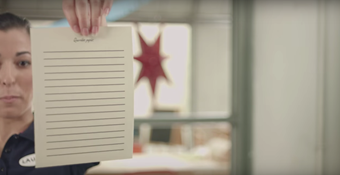 This is the case of La otra carta (The other letter), by IKEA, which was designed as a traditional spot and later became viral, although it has some points in common with the other commercials analyzed. It is presented as an experiment with 10 families but so many shots are devised in advance to increase engagement  that the more scientific appearance in distorted. Fig. 3 shows some of these shots, highlighting the detailed post-production; they break away from the simple appearance of collecting information from an experiment. 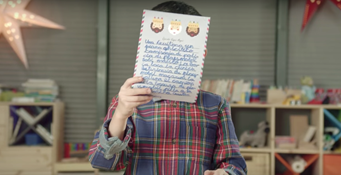 In this commercial, children write two cards with their Christmas wishes: one for the Wise Men and another for their parents. The result, predictable but equally emotional, is that they would prefer their wishes for sharing time and activities with their family to come true rather than receive material things. Fig. 3: La otra carta, by McCann MRM for IKEA. 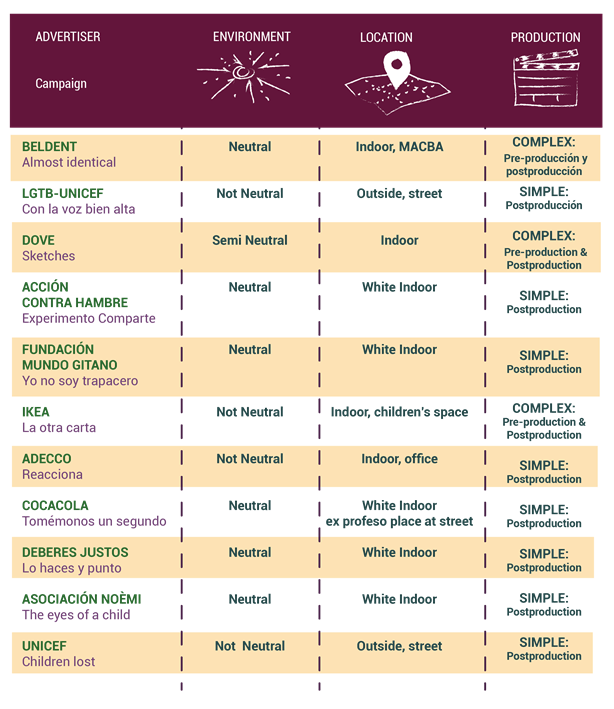 Here, it is worth highlighting Casi idénticos (Almost identical), a campaign led bycreative directors Maxi Itzkoff and Mariano Serkin, from Del Campo Saatchi & Saatchi for Beldent Infinit (see Fig 4). In it, five sets of identical twins were presented to visitors at the MACBA (Museum of Contemporary Art of Buenos Aires) to analyze their personality by answering a series of question. Around 480 people took part in the experiment, allowing for a substantial volume of data to be collected, which concluded that 73% of the votes considered the image of the twin chewing gum to be more positive (Ad Latina, 2013). As we can see, it is still a sociological experiment but it includes a quantitative information collection technique, not just the response of subjects or participants. This adds to the sense of scientific validity of this type of commercials. Fig. 4: Casi idénticos, by Del Campo Saatchi & Saatchi for Beldent Infinit. The second and third points established after the first analysis of Experimento Comparte refer to this initial scientific hypothesis, which is considered an intuition in advertising. According to Wagensberg in his Teoría de la creatividad (Theory of Creativity), this is “(...) a gentle meeting of what has been understood and what is not yet understood, what has been observed and what is not yet observed” (Wagensberg, 2017). This risk in all these advertising actions is that the success of the campaign does not only depend on the message, but also on the reaction of the subject or object studied. And that the message is created precisely by these participants, with a closure or conclusion by the brand. All these initial hypotheses ended with an insight used to set a claim for the advertising campaign. The following comparative table shoes this structure. Regarding point 4, in all cases the reactions of all the participants or subjects observed are real and spontaneous. This point is fundamental for the credibility of the communication and allows to better connect emotionally with the consumers viewing the piece from the outside. Universidad de la Rioja professor Pérez Abadía analyzed La otra carta by Ikea from a neuromarketing perspective, and affirms that it has very high emotional values as the positive surprise and happiness exceed any negative feelings generated (Pérez Abadía, 2015). Fig. 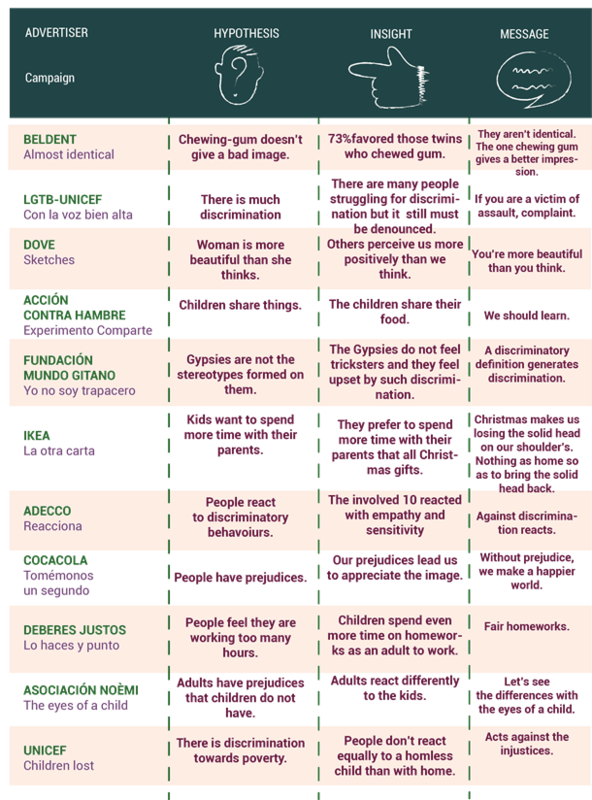 5: Table of hypotheses, messages and advertising claims. To reinforce the fact that the reactions are real and natural, with no manipulation or direction, most commercials use scrolls or informative captions. Some cases, such as Con la voz bien alta (Say it out loud) or Niña Perdida (Lost girl), were set on the street, leading us to think that the participants were there by coincidence. 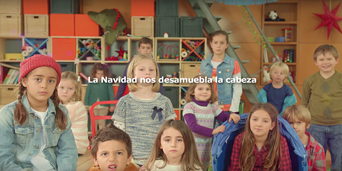 Even so, the agency responsible for the Con la voz bien alta campaign, Chocolate Comunicación, decided to reinforce this with a final caption stating, “You have just seen the spontaneous reactions of people on hidden camera” (Chocolate, 2015). As for Casi idénticos, by Beldent, because the setting for the experiment showed there was free access and therefore people could also participate freely. This was not necessary in the case of Sketches or Experimento Comparte as it was understood by the audiovisual construction of the commercial. The script was structured so as to use the same narrative. Fig. 6: Table of environments, locations and production. The last two points taken from analyzing Experimento Comparte refer to advertising production and the location where the shoot took place. Both are highly important as they contribute to the credibility of the advertising message from the perspective we are studying (scientific or pseudoscientific) and because they create other values and attributes that can be associated with the brand. The table below shows that 63.63% of these messages were shot in neutral environments and in 72.72% the production is simple (understanding this simplicity in a relative way: no excessive preproduction and post-production consisting in more or less advanced editing and some captions or scrolls). It seems obvious that there are some common points to all the commercials analyzed, which leads us to believe in the need to cling to proven truths or irrefutable data to structure advertising messages. Messages and data that are also more linked to emotional data or personal, more intimate reflections than quantifiable issues. This is something which goes beyond the marketing paradigm posed by Lenderman and Sánchez in 2008. A paradigm that exceeded traditional marketing based on persuasion, assuming that the basis for marketing was established by the truth (Lenderman & Sánchez, 2008). It seems that the marketing paradigm in the coming years will be based on persuasive truth. Various conclusions can be taken from this research, which enable us to look further in depth into the mechanisms used by advertising to create its messages. First, it seems evident that the goal is advertising based on the truth. Advertising communication that is more transparent and uses fewer resources, at first glance, that can manipulate the consumer. In these cases, the truth comes from two main pillars. The first is the fact that participants in the experiments are not actors and their reactions are spontaneous, real and not feigned. The second is that these reactions lead to a conclusion, given by the brand, which seems to come from the results obtained in the experiments. However, there are so many gaps in the construction of the scientific model that, from an ethical perspective, it would be worthy of more in-depth research. Second, advertising communication uses empirical science to construct its communication. This is because these demonstrations—these facts taken from this kind of commercials—seem irrefutable. However, except in some specific cases that inform us of the number of participants, in many others we do not know the original sample; the subjects ruled out; how the sample was selected; how the experiment was implemented; etc. Therefore, a significant amount of the information of valid scientific research is missing, has not been communicated or is very questionable. This means that future research should once again look deeper into the ethical consequences of this type of communication and whether the way it is constructed is an apparent truth based on persuasive mechanisms, or whether it is a scientifically irrefutable truth. Third, this would allow us to establish an initial differentiation between the types of experiments found in this compilation, in only four of the cases the subjects knew they were taking part in an experiment. The others, according to their narrative, were hidden cameras or the subjects in them were provided different information (such as Experimento Comparte, by Shackleton, where the children thought they were doing a photo session). Once again, this requires a more in-depth analysis to determine whether the name “sociological experiments” given to these commercials in the industry is suitable or requires greater linguistic precision. If we consider the setting for the experiments, we can determine three types of “sociological experiments”. -Those which reproduce a neutral, aseptic environment of a scientific laboratory, where the space apparently communicates nothing (although it is obvious that there is a communication interest behind choosing this neutral, non-communicative space). -Those set outdoors, on the street. -Those set indoors, in a controlled space, but that communicate, locate and contextualize. Both the subjects observed and the end consumer who will be recipient of the piece. Experiments set in a neutral environment prioritize the message and reactions from the participants. For experiments on the street, the priority to achieve a message is coincidence and spontaneity. For experiments in a controlled environment the underlying structured narrative discourse is so great that they show the advertising dimension more than the scientific one. Finally, we can see that there is also a difference between experiments which offer participants an experience and a conclusion and those shot to offer data to the consumer/viewer. In the case of Sketches, for example, Deberes los justos (We must be fair), Yo no soy trapacero (I'm not a crook) or Tomémonos un segundo más (Let's take a second longer), are relevant when we see that the subjects observed could experience firsthand these conclusions that consumers would see later in the final edition. Therefore, they are actions that foster advertising quality and impact (compared to quantity) and that would also be included in experiential marketing. These actions are all based on the idea of making the consumer live a unique, one-off experience which they can later associate metaphorically with the brand values. This name was given to 1995 and 1996 as brand production methods were highlighted and the exploitation they entailed for some groups. According to Guillermo Pérezbolde’s definition in Merca2.0 “Engagement is the art of creating a relationship of unconditional love towards a brand” (Perézbolde, 2010). - Bernays, E. (2010) Propaganda. Barcelona: Editorial Melusina. - Bunge, M. (1985) Seudociencia y tecnología. Madrid: Alianza Editorial. - Bunge, M. (2010) Las pseudociencias ¡vaya timo! Pamplona: Editorial Laetoli. - Caro, A. (2011). Esa presencia insidiosa llamada publicidad... Pueblos. Revista De Información y Debate, (47), 47. - Fernández, P. F., González, M. B., & García, F. G. (2014). Análisis iconográfico de la publicidad audiovisual de perfumes. Revista Icono 14, 12(1), 398-430. - Gay, V. (1998). Publicidad: La mejor pragmática es la ética. In D. Melé Carné (Ed. ), Ética en dirección comercial y publicidad. Pamplona: Eunsa. - Judd, C.M. & Kenny, D.A. (1981), Estimating the effects of social interventions, Cambridge University Press. - Klein, N. (2005). No logo: el poder de las marcas (A. Jockl Trans.). (3rd ed.). Barcelona: Paidós Ibérica, S.A.
- KURTZ, Paul. Is parapsychology a science? In The Skeptical Inquirer, vol 3. no. 2,1978/ 1981; pp. 14-23; republished in Paranormal Borderlands of Science. Kendrik Frazier, Prometheus Books; pp. 5-23. - Lenderman, M., &amp; Sánchez, R. (2008). Marketing experiencial. La revolución de las marcas. Madrid: ESIC. - León, J.L. (1992) Persuasión de masas: psicología y efecto de las comunicaciones sociopolíticas y comerciales. Bilbao: Deusto. - Lipovetsky, G. (2010). La felicidad paradójica. Barcelona: Compactos Anagrama. - Mattelart, A (1989). La internacional publicitaria. Madrid: Fundesco. - Mischel, W., Shoda, Y., & Ozlem, A. (2008). Introduction to personality. United States of America: John Wiley & Sons. - Morse, J. M. (2003). Asuntos críticos en los métodos de investigación cualitativa. Universidad de Antioquía. - Recio, M., & Carlos, J. (2003). Estrategias documentales en agencias de publicidad. Textos Universitaris De Biblioteconomia i Documentació, 11, 1-15. - Riquelme, M. H., & Morales, G. (2013). Metodologías y técnicas para el estudio de la mediación social: Un recorrido por sus posibilidades empíricas. Paper presented at Investigar La Comunicación Hoy. Revisión De Políticas Científicas y Aportaciones Metodológicas: Simposio Internacional Sobre Política Científica En Comunicación, 971-986. - Roberts, K. (2005). Lovemarks. El futuro más allá de las marcas. Barcelona: Urano. Empresa Activa. - Rodríguez Bravo, Á. (2004). La investigación aplicada. Una nueva perspectiva para los estudios de recepción. Telos: Cuadernos De Comunicación, Tecnología y Sociedad, (58), 34-41. - Solana, D. (2010). Postpublicidad. Reflexiones sobre una nueva cultura publicitaria en la era digital. Madrid: Doubleyou. - Sparke, P. (2010). Diseño y cultura, una introducción. Desde 1900 hasta la actualidad. Barcelona: Gustavo Gili. -Wagensberg, J (2017). Teoría de la creatividad. Eclosión, gloria y miseria de las ideas. Barcelona: Tusquets. Article received on 3 April 2018. Accepted on 24 October.